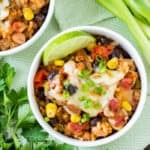 Enchilada Bake is super-easy to prepare using your slow cooker and pantry and freezer staples, and it's so tasty it is sure to become a long-time family favorite! In the slow cooker, combine the rice, chili powder, cumin, salt, pepper, canned tomatoes, tomato sauce, and broth. Cook on high 3 hours. Add the corn and the beans, mix well, and cook on low for an additional 20 minutes, until the corn is thawed and the beans are heated through. Sprinkle the top with the cheese, cover, and cook for an additional 5 minutes or until the cheese is melted. Serve as is, or with garnish of chopped cilantro, chopped scallions, or lime wedges. You can add about 1-2 cups of cubed chicken or beef if you like. If you add uncooked meat, add it before you cook for 3 hours. If you add cooked meat, add it at the end when you toss in the corn and beans. This recipe can be made vegan if you skip the cheddar cheese, or substitute a vegan cheese. If you don't have brown rice, feel free to use white rice. However, make sure it is regular white rice, not instant rice! Chicken or beef broth can be used in place of the vegetable broth.